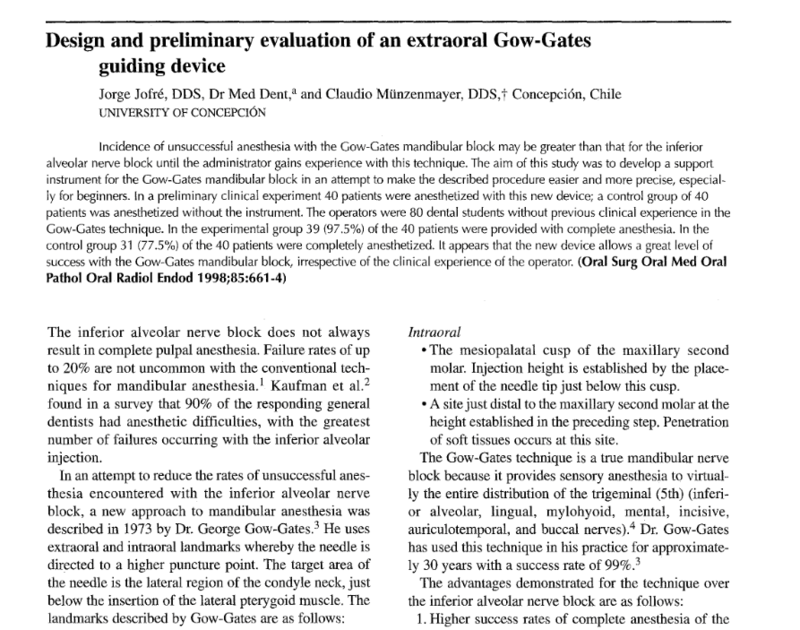 Home/publicaciones/Design and Preliminary evaluation of extra oral Gow-Gates guiding device. Design and Preliminary evaluation of extra oral Gow-Gates guiding device. Incidence of unsuccessful anesthesia with the Gow-Gates mandibular block may be greater than that for the inferior alveolar nerve block until the administrator gains experience with this technique. The aim of this study was to develop a support instrument for the Gow-Gates mandibular block in an attempt to make the described procedure easier and more precise, especially for beginners. In a preliminary clinical experiment 40 patients were anesthetized with this new device; a control group of 40 patients was anesthetized without the instrument. The operators were 80 dental students without previous clinical experience in the Gow-Gates technique. In the experimental group 39 (97.5%) of the 40 patients were provided with complete anesthesia. In the control group 31 (77.5%) of the 40 patients were completely anesthetized. It appears that the new device allows a great level of success with the Gow-Gates mandibular block, irrespective of the clinical experience of the operator.